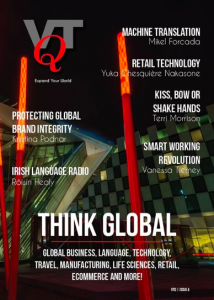 We’re thrilled to to featured in VTQ Think Global magazine! Vanessa Tierney discusses how Abodoo is driving the global SmartWorking Movement and outlines the future of remote and smart working, it’s exponential growth over the last 12 months and the benefits it provides both employees and employers. “It is really difficult to find talent online and be able to recruit the people you are looking for. So what is smart working? Smart working is having flexibility in the workplace. That could be working from home or a co-working hub work space or a combination of the two. The key word is flexibility. commute each morning. With more flexibility, more optioins would be available for employers. By 2020, 60% of all employees will be Smart Working in some capacity. Companies not looking into flexible options for their employees and growth will be left behind. Is your company ready? If you’re interested in finding out more on how to prepare your business for the future of work, drop us a note to info@abodoo.com and we’ll be in touch to help talk you through your options – from company audit, understanding where the talent is and how to hire them!